Testing of Dyno Nobel’s Differential Energy explosives system included use of a specialized Differential Energy truck, similar to the one shown here, that allowed the mine to reduce the number of trucks typically needed from two to just one that can load both wet and dry holes. Explosives supplier Dyno Nobel recently announced successful results of a trial conducted at a surface molybdenum mine in the United States. The mine agreed to an initial three-month trial using Dyno Nobel’s Differential Energy (ΔΕ) technology. The goal was to improve safety, particularly through NOX reduction, along with improving blast performance with fragmentation, oversize and hard toes. According to Dyno Nobel, by switching to Differential Energy, the mine met every goal it set out to accomplish, including lower overall production costs. 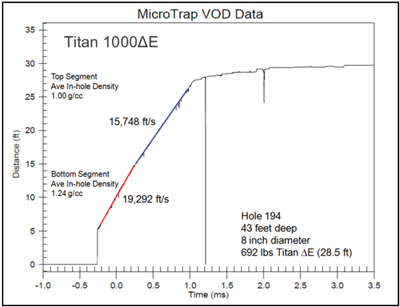 To help address the problems the mine was having, Dyno Nobel employed its Titan 1000ΔΕ technology. Prior to the trial, the mine was loading dry holes with a 30/70 mixture (30% emulsion and 70% ANFO) and wet holes with 100% gassed emulsion. The Dyno Nobel Differential Energy system allows blasters to accurately vary the density of chemically gassed emulsion as it is being loaded into the blast hole, enabling the operator to load multiple densities of gassed emulsion into the same hole to match the geological characteristics of the ground. Figure 1— Examples of the different density variations that were used at the mine during the trial. The mine had the challenge of blasting through a variety of different geologies from very hard rock to softer rock. Because of this, the blast crew loaded very high densities in the hard rock and much lower densities in the softer rock to maximize the efficiency of the blast. Figures 1 and 2 illustrate the different density variations and the measured results of detonation velocity (VOD) from one of the blasts. Figure 2— Results of detonation velocity measurements for one of the blasts. • Safety—Differential Energy proved to be a reliable and resilient product that provided dependable results where no undetonated blasting agent was found in the muck piles. • Air Quality—The number and severity of NOX incidents were significantly reduced. This allowed the mine to consider revising its air quality permit to allow for larger blast events. 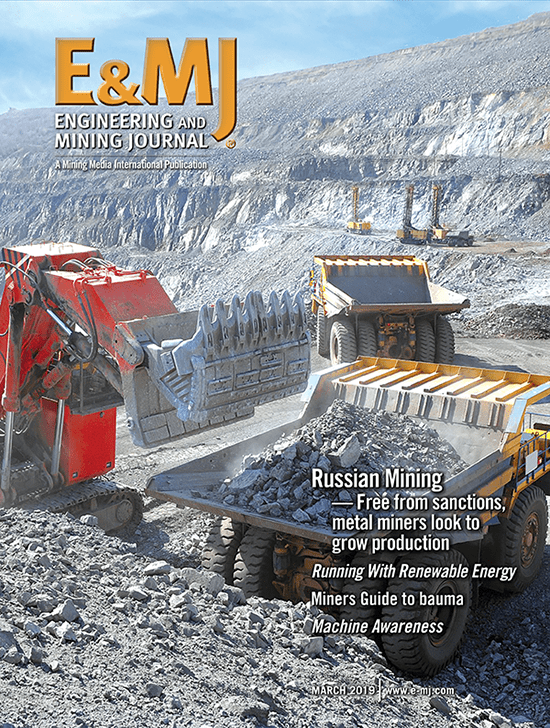 • Productivity—Switching to Differential Energy allowed the mine to go from using two bulk trucks to a single truck that can load both wet and dry holes. The Differential Energy truck provided a faster turn-around time and a larger capacity allowing for more holes to be loaded per cycle. • Fragmentation and Dig-ability—Over-sized and floor grade problems were noticeably reduced. There were no physical measurements of fragmentation, but drill and blast managers and shovel operators observed a noticeable improvement in dig times. Since the trial, which took place more than a year ago, according to the company, the mine has fully adopted Differential Energy technology—using 100% Titan 1000ΔΕ—and no longer uses ANFO. Dyno Nobel’s Differential Energy technology enabled the mine to redistribute the explosive energy in the blast hole, distributing accurate amounts of energy throughout the hole, varying the detonation pressure. 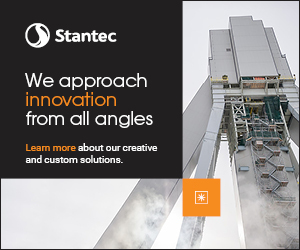 This process reduced NOX, improved fragmentation, oversize and hard toes, and increased productivity while reducing overall costs.